Middle School is an exciting time as students become increasingly independent with their studies and begin to take more responsibility for their learning. Our extensive and proven curriculum has been continually refined for years and is among the best available. All courses are taught by highly qualified teachers who care about your child's success. Why is American High School Better? Our program inspires and motivates your child to acquire the skills needed to succeed in middle school, high school, and beyond. Students in our online middle school are encouraged to take the lead in their studies and is held to high standards as they progress toward high school. We are one of only a handful of schools to be both fully regionally and nationally accredited with SACS/CASI, CITA and AdvanceEd. We hold the highest levels of accreditation possible. 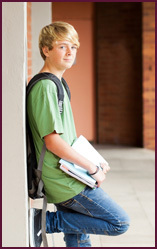 All completed work is transferrable to any other middle school and qualifies your child for any high school. Our program allows your child to complete a full middle school curriculum or take individual courses to supplement a traditional or homeschool education. Students learn at their own pace in a secure, nurturing, bully-free environment that allows focusing on studies and building lasting friendships. Student's in our middle school program experience a genuine commitment to their academic progress with individual support that is second to none. Our teachers are professional educators who deeply care about each student and are here to help them maximize their potential. They believe in proactive communication and are available to answer questions about your student's progress through instant messaging, voice, or video. Our online learning environment encourages exceptional critical thinking skills, develops curious minds, fosters ambition and leadership, and builds service-focused character. Our middle school program is at the forefront of effective learning technology. We incorporate the latest proven innovations into our online platform to ensure your child's success. Anyone looking for a flexible and outstanding middle school experience! American Online High School offers a complete fully Accredited online Home School / Middle School for grades 6 - 8 that is designed to ensure student success in High School; and a High School with college preparatory curriculum for Grades 9 - 12.
Review our full list of core classes and general electives with these links.